This is port from "Enemy Equipment SE". Fix: You lost quest item if you did not loot from chest. 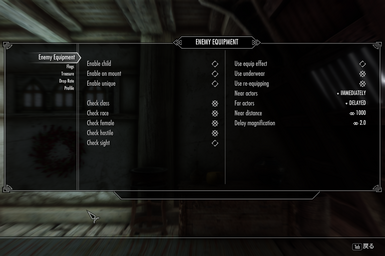 Fix: Equipment setting could not be applied in some condition. Treasure chest has owner's name. Almost creature will drop chest. "Girl's Heavy Armors (CBBE) Stand-Alone version" is supported. "Dragonbone Barbarian Armors" is supported. 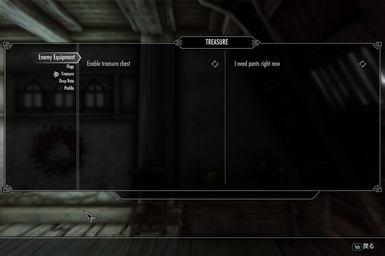 Dragon and Draugr will drop treasure chest now. Fix treasure chest position and angle. No more key into treasure chest. Fix and optimize many thing but I forgot. "Simply Clothes - SSE CBBE BodySlide (with Physics)" is supported. Treasure chest function has been changed. Enemy will drop treasure chest. Chest has item what enemy had. This is port from Enemy Equipment SE. I made this because someone need this. I am sorry but almost equipment mod are not tested. Script based. Never change leveled list. A treasure box comes out occasionally. You can customize anything via MCM. This mod should be compatible with almost anything except mods that do the same thing.